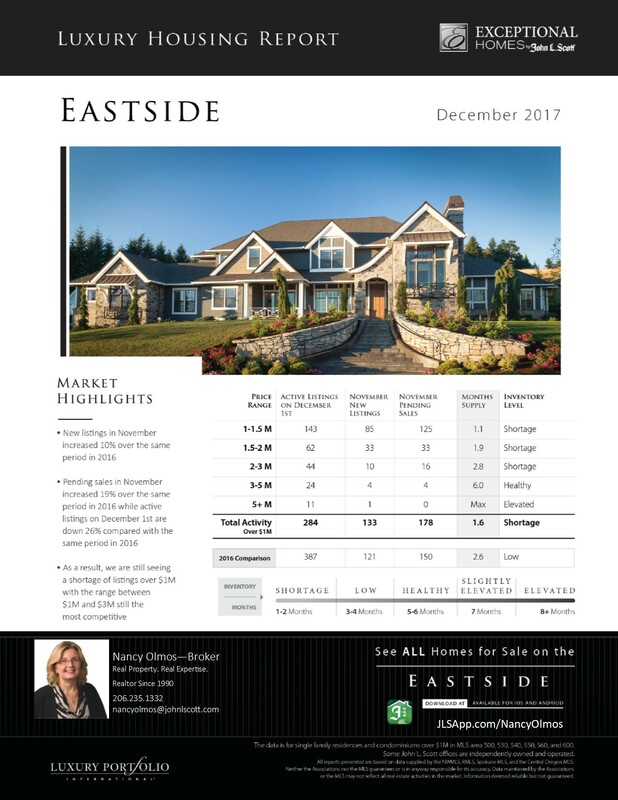 With the start of a fresh new year in real estate, it’s the perfect time to look back at how the luxury market fared in Greater Seattle and the Eastside last year. Nancy Olmos - Realtor - John L. Scott HWP, Bellevue shares the real estate industry trends of 2017 and what they might mean moving into 2018. As a trusted Realtor® for over 25 years, she strives to keep clients informed about market trends so they can make the best buying or selling decision. The $1 million market is seeing a shortage in new listings. New listings are showing only a 10% growth compared to an increase in pending sales of 19% over the same period one year ago. This shortage of supply is fueled primarily by a genuine shortage of properties in the $1-to-3 million markets, with an under two-month supply in both the $1-to-1.5 million and $1.5-to-2 million markets. The $3-to-5 million market remains healthy, and the $5 million-plus market shows little movement. Compared with the same period in 2016, this overall downward supply market trend has resulted in a 26% drop in active listings. While the 19% bump in sales reflects a strong demand from buyers, the monthly supply has seen a nearly 1-month drop in the same year-to-year period. The need for sellers is strong, and prospective new listings should be motivated by the strong buyer demand and leverage found in such a short-supply market. In contrast, the $5 million-plus market has seen little movement and is, by all measures, a strong buyers market. The $3-to-5 million market is far more balanced, with a healthy supply of buyers and sellers. If you want to work with the best in residential real estate in Washington, look no further than Nancy Olmos - Realtor - John L Scott HWP, Bellevue. With 27 years of experience serving the Greater Seattle Area and Eastside, Nancy Olmos is your trusted real estate partner. From remodeling to staging and marketing your home, she is the Realtor with the market knowledge and expertise to guide you through your toughest transactions. To schedule a free consultation, give her a call today at (206) 235-1332 or visit her website for more information.